If you're a big Street Fighter fan, you probaly know the "You Lose" poses for each character all too well. Great news: You can now get them immortalized as special USB flash drives via Hong Kong-based manufacturer BigBoysToys, just in case you wanna take the "L" every time you move data from one computer to another. 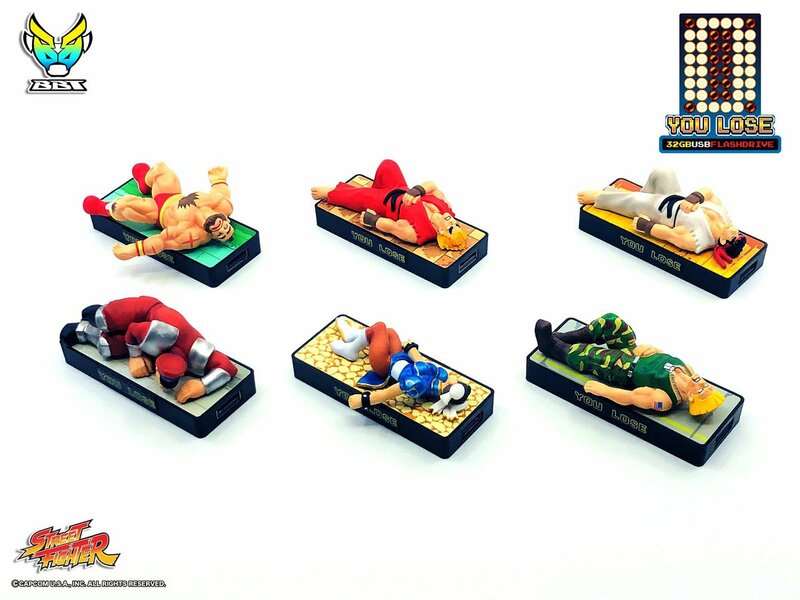 Capcom just announced the series of flash drives, which encompasses Street Fighter II's roster in their signature K.O. poses, from Zangief to Guile and several other fan-favorite characters. Each flash drive comes packing 32GB of storage, so you have a decent amount of space to work with. Every character is laying on a specially-designed USB drive brick based on various stage floors, so all of them look different. Each miniature figure can be removed from the drive so you can display them elsewhere as well. And it's also cool that the "You Lose" font lights up when the USB drive is in use. You can choose from Ryu, Ken, M. Bison, Chun-Li, Guile, and Zangief, and the set launches in Japan this June. Each will be available for 4,644 yen, or about $42. That's a little pricey for a USB drive, but then again, these are pretty special. You'll probably be the only Street Fighter fan you know with your own personalized drive and "You Lose" pose, especially since there doesn't seem to be a western release planned for the line just yet. You can preorder your favorite USB drive now via BigBoysToys with free shipping here.